Here’s my latest — long-delayed, I realize. Apologies for a crazy few months getting in the way of posts to Veg Here! I continue to experiment with granola. My colleague had given me feedback on the last batch that it was too wacky. 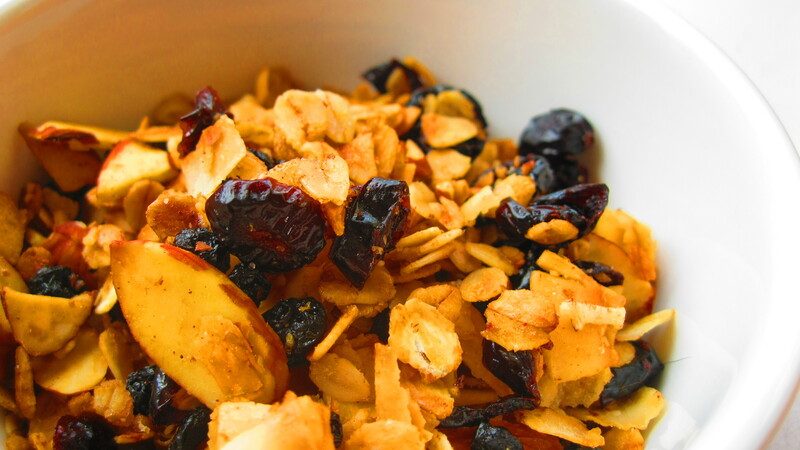 What she really loved in granola was a hearty, healthy, wholesome flavor profile. So, in honor of her (her initials are CBA), I made this mostly fruit and nut variety. I added a little dark rum to punch up the flavors, but otherwise this is a classic version. In a large bowl, mix oats, almonds, coconut and brown sugar. In another bowl, mix agave, rum, vegetable oil, salt and vanilla. Mix together dry and wet ingredients. Pour mixture out on a cookie sheet and spread evenly. Cook granola for 1 hour and 15 minutes, stirring every 15 minutes. The granola should be evenly browned and toasty smelling. Stir in cranberries and blueberries.